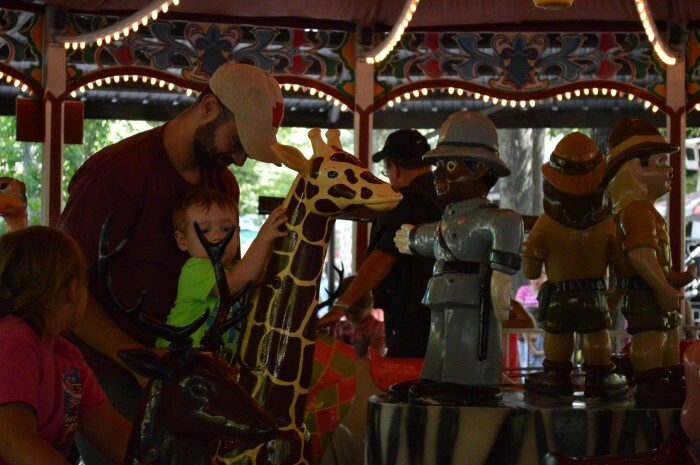 Knoebels has two carousels: one small merry-go-round in Kiddieland (added in 1976) which was built by Stein & Goldstein in 1912; and the Grand Carousel, a 1913 carousel built by Kremer Carousel Works in Brooklyn, with a frame by Charles I. D. Looff, (1852-1918), and 63 hand-carved horses by Charles Carmel (1869-1931). It was purchased on January 26, 1942 from Riverside Park in Piscataway, New Jersey for $4,000 (equal to $57,735 today) and relocated to Knoebels. Today, the Knoebels Grand Carousel is now one of the largest carousels in the world, with 63 horses and 3 chariots. It is one of the few carousels remaining with a working ring dispenser, allowing riders on the outside row of horses to reach out and grab steel rings as they pass. The rider who grabs the brass ring receives the cost of the ride in tickets, making the ride free. Three band, or fairground organs provide music for the riders, with the largest one built in Germany in 1888 by Frati and Co, and operating at Knoebels since the year it opened in 1926, 87 years ago. The smallest one is a replica built in 1995 by Gebruder Bruder Co. In the 1920s, the larger organ was converted to artisan roles. Have I mentioned how much I hate AUDIO ADS? Well, I do. They’re very irritating.